Hi friends. Today I’m sharing another card showcasing some more of the new vintage dies from Cheery Lynn Designs along with some gorgeous ribbons from Really Reasonable Ribbon. I just love the new Dusty Miller Square and Dusty Miller Corner dies. They are just so versatile. I tend to stick with 5-1/2″ x 5-1/2″ square cards though and the corners were just a little too big. This was easily remedied by snipping them where the to parts meet up and layering them. They then became just the right size for this card. My card design is pretty straight forward. 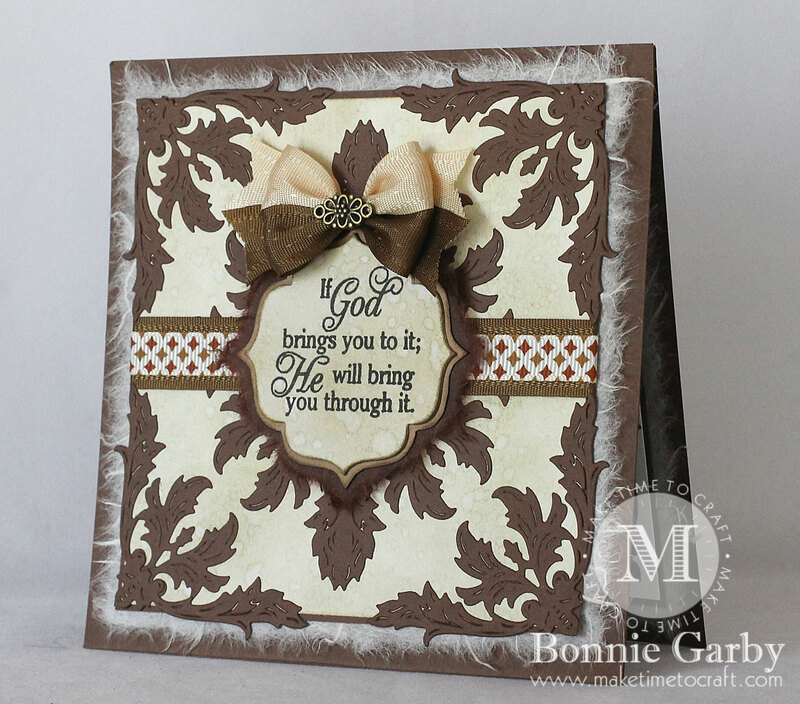 I created a piece of background paper using Distress Inks in old paper, antique linen and frayed burlap. 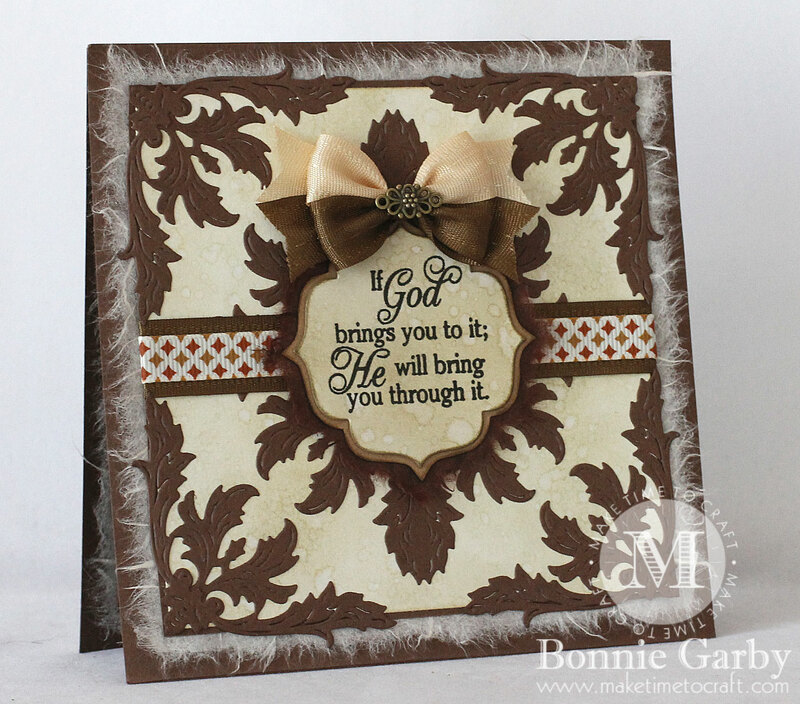 That was layered on a piece of dark brown and then I added my die cuts. Next I added a layered strip of ribbon using Turftan Brown Delicated Stitched Satin Ribbon topped with Gold and Copper Diamond Print Grosgrain Ribbon and secured it on the back of the large dark brown base. Then I added a layer of natural mulberry paper with torn edges. That was then adhered to my card base. I stamped my sentiment on to a piece of the Distress Ink paper and cut with the Vintage Bracket Shape die set, added a layer of kraft card stock and then backed with brown mulberry paper. This was then added to the card over the ribbon using foam tape for some dimension. My card was finished off with a pretty bi-color bow made on my Bow-it-All V3.0 Tool using Raw Silk and Turftan Brown Delicate Stitched Satin Ribbon from Really Reasonable Ribbon. I added an Antique Bronze Vintage Flower Charm to the bow center. love this adorable looking card so much! This is beautiful! I just love anything vintage, it is right up my alley! And I am a huge fan of neutrals. This card is just so lovely! I love that bow!!! Gorgeous bronze embellie too! Hope you are having a wonderful week! Thank you for also playing along with us this week in our FFC!! A gorgeous creation! 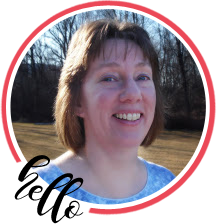 Thanks for sharing this great project with us at Crafting with Dragonflies. What a beautiful monochromatic card! And I love the sentiment! 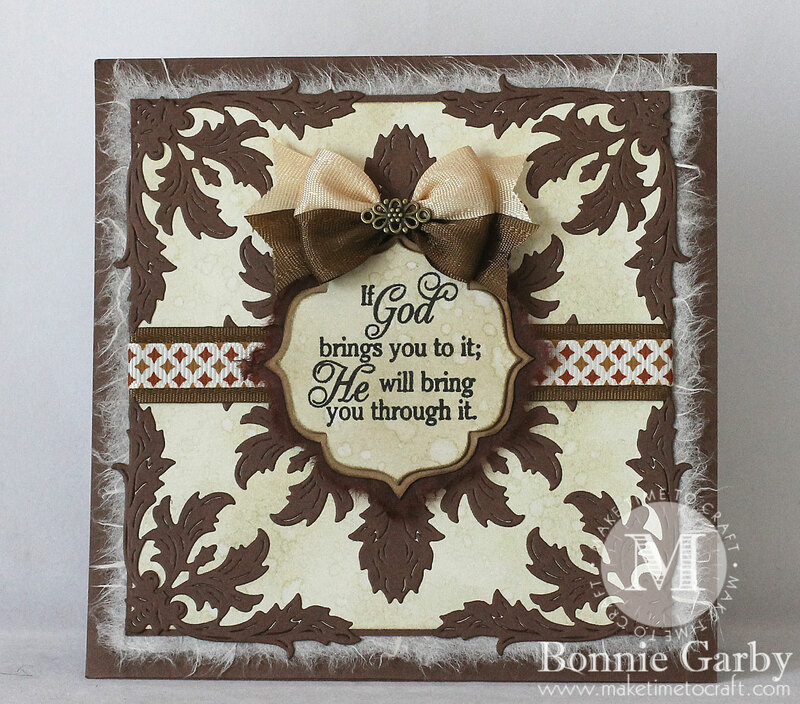 Thank you so much for entering our ATG challenge at Through The Craft Room Door this week. Looking forward to see you again next challenge. Yippee! 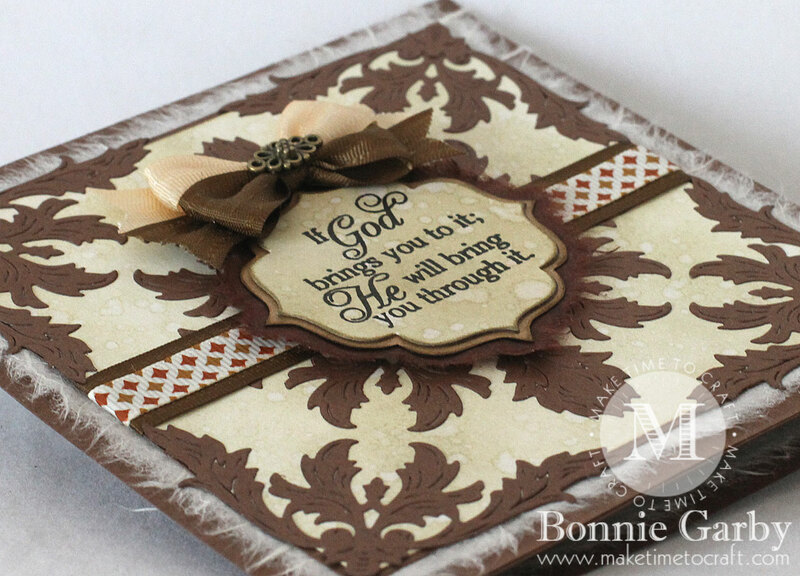 I’m so happy you entered this in our All Squared Up challenge at A Vintage Journey, too! This is so gorgeous!! I love the dies you used!! The mulberry paper peeking out the edges is so fabulous!! Beautiful card!! Thanks so much for playing along at Scrapy Land!! A beautiful elegant card. Loving your bow. Thanks for joining us at Make My Monday. Caz DT.